A heart surgeon has been suspended on full pay for two-and-a-half years at a cost to the taxpayer of up to £500,000 while he faces bullying allegations. Consultant Peter O’Keefe, 49, has been on ‘gardening leave’ since April 2012 amid fears he has been targeted as a whistleblower for raising concerns about patient care. The NHS in Wales is continuing to meet his salary of around £95,000 a year while having to pay a similar sum to another surgeon filling his role. Mr O’Keefe was suspended from the University Hospital of Wales in Cardiff after being accused of bullying junior colleagues. But 18 months previously he voiced concerns about the treatment of a patient who suffered serious brain damage. His intervention resulted in a critical report into safety failings. Mr O’Keefe has been prevented from working at a time when his hospital has been heavily criticised for lengthy waiting lists for cardiac procedures. The Conservatives accused health bosses of wasting money that could be spent on treating patients by ‘dithering’ over the disciplinary hearing – the latest in a series of scandals to hit the Labour-run Welsh NHS. Cardiff and Vale University Health Board denies there is any link between the surgeon’s suspension and his earlier complaint about care standards. A friend of the cardiothoracic surgeon said Mr O’Keefe suspects he was victimised for speaking out. 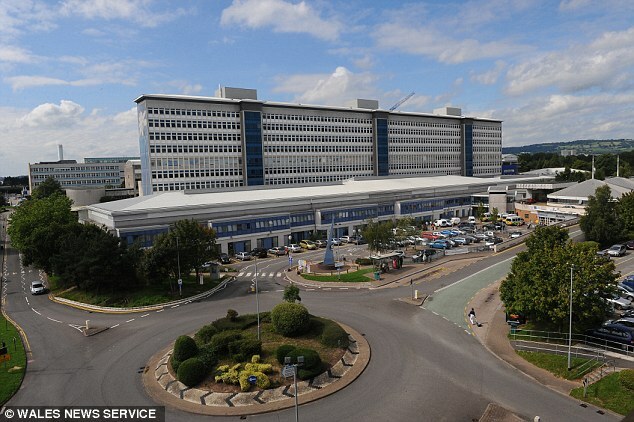 But a spokesman at the Cardiff and Vale University Health Board told MailOnline, that is ‘absolutely’ not the case. ‘We absolutely reject the suggestion that the suspension of the surgeon in question is in any way related to any concerns he may have expressed about the care of patients,’ he said. His case was highlighted by the Conservative opposition in the Welsh Assembly yesterday, as an example of waste in the NHS. Shadow Health Minister Darren Millar said: ‘When serious allegations are made against any member of NHS staff, it is right that such claims are thoroughly investigated. ‘But there is no reason why it should take over two and a half years. ‘Against a backdrop of a crisis in cardiac care that has seen Welsh patients sent to Bristol for treatment because waiting times were so severe, the Welsh NHS cannot afford to have specialist surgeons suspended for two and a half years on full pay. In July 2013 it emerged the University Hospital of Wales had been branded ‘dangerous’ in a damning new report, that said patients were at risk because of increased waiting times. The Royal College of Surgeons (RCS) warned people waiting for heart operations at the hospital in Cardiff were ‘dying regularly’ and some children were suffering as a result of the delays. A&E and intensive care units were ‘frequently gridlocked’ with patients ‘often stacked up in corridors and ambulances’. In May bosses at Cardiff and Vale University Health Board confirmed plans to invest £2.4million in tackling surgical waiting lists. It came as the RCS acknowledged improvements had already been made. Dr Graham Shortland, the health board’s Medical Director, said: ‘There has been an incredible amount of work to improve surgical services over the last year and things have moved on considerably. ‘However, we do know that there is still much to do and we are only at the start of delivering our ambitious proposals. ‘The Welsh NHS is reeling from Labour’s legacy of record-breaking cuts. ‘Yet a health board which last year had its accounts qualified for breaching its spending limits can afford to pay a senior surgeon a near-six-figure salary while suspended and pay similar salaries to locums to cover his workload. Dr Richard Lewis, Welsh Secretary of the British Medical Association, said: ‘I can’t comment on the circumstances of this particular case, but long suspensions are never good for the individual concerned or for the health service. Dr Graham Shortland, the medical director for Cardiff and Vale University Health Board, said: ‘We do not take disciplinary steps lightly, but believe that when serious allegations are made the University Health Board has a duty to patients, staff and the people we serve to investigate such allegations thoroughly. ‘We can confirm that a surgeon has been suspended since April 2012. We have been following the Welsh Government’s disciplinary procedure in order to ensure there is a full and fair investigation. ‘Unfortunately, through no fault of either party, the process which has already taken far too long, has been held up. However, we hope to be able to secure a way forward in the next few weeks. ‘Due to the legal and confidential nature of such issues we are unable to say anything further. The board confirmed that Mr O’Keefe’s surgical work was being covered on a locum basis to minimise delays for patients. Locum costs are on the consultant pay scale between £72,927 and £94,679. Mr O’Keefe, who qualified as a doctor in 1987, did not wish to comment.